Enjoy a long life with our quality, hand-thatched brush fencing installation on galvanised steel frames. We control the quality of our brush fencing installation and only source from our reputable supplier whom meets all the harvesting requirements. You can have peace of mind knowing that your brushwood fence is from a sustainable source and environmentally friendly. You choose between concrete or timber fencing base, for a long lasting and low maintenance brushwood fence. We specialise in heavy-duty swinging or sliding gates, with manual or fully automated operating systems. You can even operate your gates by phone if required. We only use only the highest quality gate hardware. 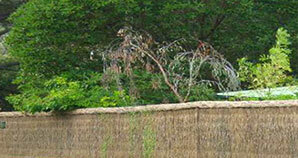 What’s involved in brush fencing installation? First, we consult with you to establish your needs and desires. What do you envision for your property? How do you want to use your space? Is privacy paramount? Do you love entertaining guests? How can we budget for this? Next, we assess the area and create a brush fencing installation plan. We discuss this with you. We then install the posts and necessary framework for the brushwood fence or feature. We cater for many designs and features, including arbours, gazebos and swimming pool fences. Take a look at our gallery here. We also navigate uneven areas, such as trees, walls, rocks and other fixtures. Brush fencing installation also accommodates letterboxes (of many shapes and sizes), built into your brush fence. We cater for many custom designs such as internal steel frames or windows, so that you can still see special features in your garden. With more than 20 years of brush fencing installation expertise, we have brought many customised designs to life. Contact us to find out more about how we can help you better enjoy your property with brushwood fencing.